The report published by Persistence Market Research offers the forecast on the global remote patient monitoring device market for the period 2017–2024. The main objective of is to provide information and updates on the opportunities in the market. The report also offers key insights on the latest developments in the remote patient monitoring device that are transforming global market for remote monitoring devices. The report starts with the executive summary with an overview of the global remote patient monitoring device market and the adoption of the remote patient monitoring device worldwide. The section also focuses on the major factors that are influencing the market growth. The report also offers market dynamics including latest trends, market drivers, challenges, and growth opportunities. Impact analysis is also offered in the report on the basis of the weighted average model. A study focuses on the key regions and on-going trends in the regions to help in identifying growth opportunity. The report on the global remote patient monitoring device market shows how the market performed in past and how it is expected to perform in the next few years. The report offers details on revenue generated and expected revenue during the forecast period 2017-2024. The report also provides segment-wise analysis on the global market for remote patient monitoring device. On the basis of segments, the market is divided by product, end user, application, and region. All the key segments are further divided into sub-segments. The report provides data on each of the segments in terms of CAGR, year-on-year growth, market size, and incremental opportunity. The report highlights latest trends in the global market for remote patient monitoring device. It provides an outlook for the forecast period 2017–2024 on the market by taking into account all the major factors. The study also sheds light on how frequently the remote patient monitoring device are used across the globe and major drivers that are influencing the growth of the market. 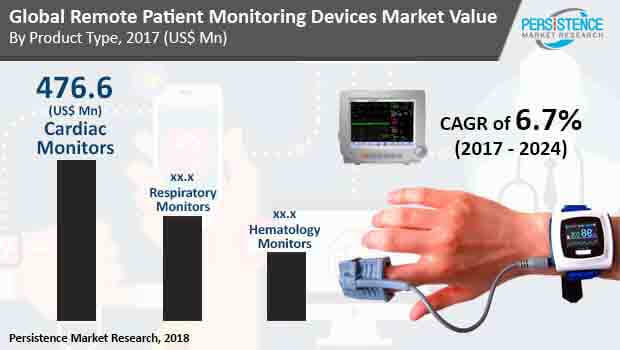 The last section of the report focuses on all the key market players active in the global remote patient monitoring devices market. A detailed profile of all the leading players is provided in this report. The long-term and short-term strategies, latest developments, and technological advancements in the market is given in the report, along with the factors that are helping the companies to stay competitive in the market. The market size, along with qualitative and quantitative factors are offered in the report on the basis of the primary and secondary research. Data on the key regions which are further segmented into countries is given to understand the market in a better way. The opinions offered by industry experts have also been incorporated in the report to show where the market is headed. The report offers forecast in terms of volume and value and also helps in identifying how the market will perform with growth opportunities in the near future. The data provided on the global remote patient monitoring device market is triangulated by taking into account drivers that are influencing demand and supply side in the market. The report also offers forecasts on the market including expected CAGR, revenue, and volume during 2017-2024. Remote patient monitoring technology includes devices such as blood pressure monitoring system, glucose meters, and other portable devices that can be used by patients at a remote location. Increasing use of smartphones is leading to the rise in the development of applications that are connected to the monitoring device being used. These mobile applications help in recording and transmitting patient health-related information or data to the healthcare providers. The aim of the companies in the market is to provide remote patient monitoring devices is to provide better chronic care management while keeping the cost down. Also, the manufacturers are focusing on developing easy-to-use monitoring devices that can help patients manage conditions including heart diseases and diabetes better by avoiding costly medical procedures. However, some of the obstacles facing the global remote patient monitoring devices are there is very little standardization among devices due to the number of companies in the market, some of the monitoring apps are considered same as the medical devices, hence, these devices need approval from the Food and Drug Administration (FDA) to be used in clinical setting. People are concerned about privacy and security, especially in the case of health-related data. Hence, the manufacturers are focusing on providing layered data security and device management solution. As per the Persistence Market Research (PMR), the global remote patient monitoring devices market is anticipated to see a strong growth between 2017 and 2024. By 2024 end, the global remote patient monitoring devices market is estimated to reach US$ 1,502.9 Million revenue. Cardiac monitors including heart rate monitor, fetal heart rate monitors, ECG monitor, and blood pressure monitors are expected to see a significant demand worldwide. Rise in cardiovascular diseases, accounting for around 31% of deaths globally is one of the important factors driving the demand for cardiac monitors. It is also considered to be the number one cause of death and more people die of cardiovascular diseases compared to any other diseases. Arrhythmia is responsible for the majority of deaths globally, hence, ECG interpretation is preferred on a large scale to diagnose and measure arrhythmia. Therefore, companies are providing advanced ECG monitors, ensuring accuracy and integrating software that helps in transferring data directly to the electronmic medical records. Manufacturers are also developing portable and wireless ECG monitors that can be used anywhere and anytime. Advancement in technology and communication system is driving the trend of telemedicine worldwide. Moreover, telemedicine approach uses remote patient monitoring system or devices to keep a check on the health status of patients. Companies are developing tool-kit to monitor various chronic diseases. These tool-kit include portable and easy-to-use remote patient monitoring devices. These tool-kits are designed to offer real-time monitoring, with faster and actionable feedback. Moreover, the devices are also equipped with sensors that help in making the process of monitoring simple and convenient. Along with cardiac monitors, companies are also working on developing monitoring devices for hematology including blood glucose monitor and for respiratory diseases including sleep apnea and respiratory rate monitor.